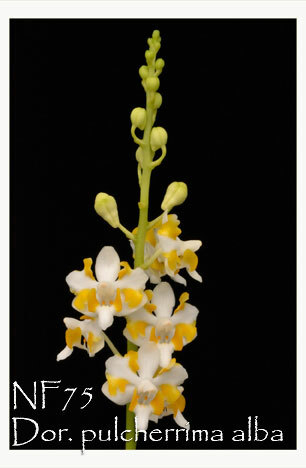 A new generation of this stunning peloric form of Doritis pulcherrima alba ! Both parents are the result of a complex strain of three varieties of Dor. pulcherrima, var. alba, var. buysonniana and var. champornensis, resulting in the bright canary yellow edging or peloria on the petals. A summer bloomer, it can produce multitudes of 4cm flowers spiraling around its tall inflorescence. An easy-grower with a compact leaf span, it will make basal keikis once fully mature, adding even more abundance to its flowering display. Truly unique and Highly Recommended !